Are You Leaving Airline Points on the Table? No matter the size of your travel program, there’s a chance your company is missing out on thousands of dollars in benefits by neglecting to maximize savings through corporate airline loyalty programs. Even if you have enough volume to score multiple discount rates with different carriers, it’s still possible you could be leaving airline points on the table. Likewise, if your firm doesn’t travel enough to garner a primary airline contract these loyalty programs are essential to reducing your air travel cost. The secret is to utilize a loyalty program whenever, or rather, wherever possible based on your travel patterns. For larger accounts, these will be off-contract bookings where the lowest available rate in a particular market always lands with a strong regional carrier. For smaller accounts you may have multiple regions where your travelers consistently fly, in addition to markets where your home town carrier dominates. Corporate airline loyalty programs are separate from standard frequent flier programs, that award miles or points to individuals, who use them for upgrades or complimentary tickets. That means you can double dip when you fly. And while the marketplace may be experiencing some turbulence due to recent changes in the way travelers earn miles, and the amount of inventory dedicated to upgrades, these programs represent a significant source for savings. The world’s largest airline, American Airlines, has a substantial loyalty program dubbed BizExtrAA. Once you sign up, you simply enter the membership number in your reservation details when booking a flight. For each $10 spent on air travel (excluding taxes and fees), a company earns two BizExtrAA points. This includes flights on American and its joint venture partners British Airways, Finnair, and Iberia, plus you can earn points on any codeshare flight operated by Finnair, Japan Airlines, or Qantas Airways. Rewards include domestic flights for 2,000 points or flights to Europe at 7,200 points. Cheaper options include drink or headset vouchers or Admirals Club day passes for 300 points. It’s important to keep track of your flights to make sure the proper credit is given. The BizExtrAA program is the least restrictive of the major legacy airlines because there is no minimum spend or number of participating travelers required. To join, click here. 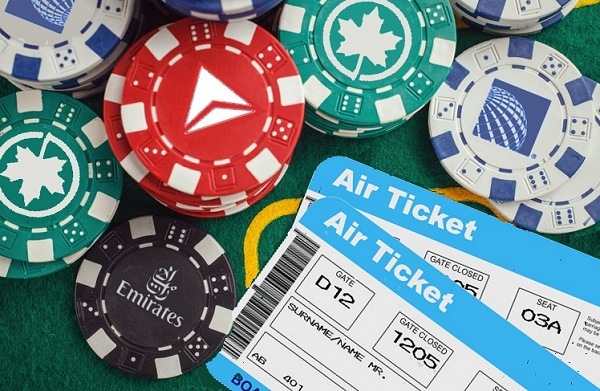 Delta’s SkyBonus is a bit more regimented in that $5,000 must be spent cumulatively by at least five travelers each year for the account to remain active. The earning structure varies depending upon the type of ticket that you book, with flights originating in hub cities penalized with fewer points (presumably because there are more desirable nonstop flights and less incentive is needed to book them). Pricier fares can earn as many as 30 points per dollar spent, and companies that earn two million points in a calendar year are given “elite status,” which earns even more points per dollar spent. Awards include Sky Club memberships for 125,000 points or long-haul flights to South America for 460,000 points. This sounds like a lot, but when you have many people traveling, the points can add up quickly. Points can be earned for travel on Delta, Delta Private Jets, or its joint venture partners Air France, Alitalia, and KLM. Even if you forget to enter your number when making reservations, you can retroactively request credit using a simple online form. To join, click here. At United, PerksPlus has a higher threshold for entry because it requires a minimum of five participating travelers and a spend of at least $25,000. Points can be earned on flights with United and numerous partners, including ANA, Austrian, Brussels, Lufthansa, and Swiss International. Two points are awarded per dollar spent except for those traveling from hub cities where there is less competition. In those instances, only one point per dollar is awarded. More expensive fares can earn as many as six points per dollar spent. True to its name, there are some great perks like a United Club membership for 65,000 points, drink or headset vouchers, and the ability to gift elite status to travelers for as few as 60,000 points. To join, click here. British Airway’s On Business program enables your firm to earn points on qualifying flights with American Airlines, British Airways and Iberia or by using the British Airways American Express Corporate Card. Each £ spent earns 1 point, and when your total volume grows there is a 25% and 50% bonus added for Tier 2 and Tier 3 accounts. Be advised, points expire after two calendar years. To join, click here. Virgin Atlantic’s Flying Co program works alongside their Flying Club frequent flier program. Rewards on Virgin Atlantic and Delta flights pay your company 40% of the miles given to individual travellers, excluding any tier bonuses. Miles can also be earned at many different partners for hotel stays, Virgin train tickets, car rental bookings, and many other categories, also generate miles, most at 10% of the individual reward rate. While the corporate percentages could be considered stingy, the number of partners are not and include such brands as Hilton, Marriott, Hyatt, Avis, Hertz and Texaco. To join, click here. One of the prime benefits of Air France/KLM’s BlueBiz is that Blue Credits are like cash and deliver instant savings on your company’s travel budget. Since each Blue Credit equals the value of 1 US$, it is easy to calculate how many credits you need to redeem for a free ticket. For example, if the ticket price is $550, you need 550 Blue Credits. You can pay for the entire ticket with Blue Credits, including taxes and surcharges. The Blue Credits you earn on flights depend on the destination, booking class and airline you fly with. Other perks: BlueBiz members can request a full name change on tickets issued by AIR FRANCE or KLM on selected booking classes, provided your BlueBiz number has been inserted in the booking before issuing the ticket. Also, you can retroactively claim previously unregistered flights taken within the last six months. To join click here. Emirates Airline offers Business Rewards that allow you to use your points to book reward flights and upgrades. You will earn 1 Business Rewards Point for each USD 1 spent on the base airfare, including carrier charges but excluding taxes and other industry partner charges. Business Rewards Points are only earned on Emirates flights, and not on codeshare, interline or other partner flights. Individuals who are already Emirates Skywards members will earn Skywards Miles and Tier Miles at the normal rate. They will also earn Tier Miles on the flight. If the person travelling is not an Emirates Skywards member, they will not earn Skywards Miles, but the organization will continue to earn Business Rewards Points. To join, click here. At your enrollment anniversary, your company will earn bonus rewards based on the total amount your company has spent on travel the previous year. To join, click here. Air Berlin’s Business Points program allows you to earn points on travel booked with partner airlines American, Alitalia, Etiad, Jet Airways and Virgin Australia. Points are good for three years. A good choice if your firm has a lot of business in Germany, Air Berlin also has connecting flights all over the world so it’s easy to build your points if you decide to maximize this program. To join, click here. And while Qantas Airlines has a Business Rewards program, only Australian companies are currently able to participate. (US based travelers can earn points on Qantas flights through American’s program.) For those who are eligible there is a one-time membership fee of $89.50 and includes the option to boost your points balance with everyday purchases at more than 40 partners across a wide range of business services. To join, click here. North American travelers are also shut out of Lufthansa’s PartnerPlusBenefit program, which features rewards bookings on 10 partner airlines. (Companies enrolled in Air Canada and United’s program can apply credits earned on Lufthansa flights through these partnerships.) Travelers based anywhere beside North America can join Lufthansa’s own program by clicking here. In closing, with minimal cost and eligibility requirements to join these programs, it makes sense for business owners to sign up and participate in as many that fit your company’s travel profile. Teplis Travel helps its corporate clients manage their airline loyalty programs, applying earned credits to purchase higher-priced airline tickets, maximizing return. To find out more about our cost saving programs, contact your Teplis representative today.